Please add a way to add multiple accounts from different tenants to Teams apps, both mobile and PC. Slack has this feature and it is crucial for consultants working with different companies. Please vote on this on the feedback link as Roberto suggests. That said, suffice to say that this is a commonly requested feature and is something we are actively pursuing. We agree with you! Hi Roberto - great scenario, and thanks so much for posting a feedback suggestion. I would consider this a form of guest access - you want to be able to have your primary account and associated teams, but also be able to join teams hosted in another tenant, like a customer or partner. And I can add all these different accounts to my iOS and PC slack app. Scenario #1 is critical to my business; I cannot log in/out for the two efforts I have underway. Would the Azure B2B collaboration work for this? I do agree though, the easiest would be to just allow the user to login to mulitple accounts at one time (similar to Slack). I actually have the reverse problem. I'm the client and have a couple consulting partners I want to include in a team but it's difficult for them as they have their own O365 teams setup plus other clients to connect with, etc. I tried to click the link to vote but it doesn't seem to be functioning. I want to vote for this feature but the link in the OP is giving me a page not found. Anyone else having the same problem? this is become a major issue accross microsoft products. They either dont support multi-account/tenant or it is a major pain. I believe the user voice link doesn't address the originally stated issue, which is that a user from one tenant can't join another tenant's team. For example, assuming both a project consultant and the customer are on a business plan, the consultant can't create a team for the project and invite the customer to join it. You got this to work on the desktop client? 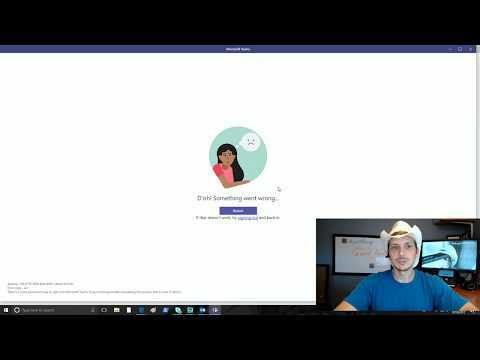 This How-To video provides a brief overview of how to Enable Guest Access in Microsoft Teams, invite an external guest to a Team, accept a Teams invite and join the Team, and Switching between Teams accounts. This continues to an issue. With security updates and lockdowns it has become an acute problem. I have two accounts, one for the company I work for and one for a professional association in which I volunteer. I currently have to log-out and then re-login (i.e. only one account can be active at a time) several times a day. Companies consider it a security risk to allow members outside the company domain. I am part of 3 "Teams"/Different companies in which I own. I have now reverted 1 company away from Teams and back to Trello/mobile messaging, access 1 company Team page via Chrome, and the main company via Desktop and phone app. I wish we were never advised to use Teams...pushing to move all companies back to Trello for seamless multiple account access. Can someone at Microsoft please advise if this feature will ever exist? If not, back to Google and Trello options as they are MUCH easier to implement for multiple companies. This thread seems to be addressing two different problems. The one that I'm interested in seeing resolved is the ability to have two instances of Teams open at the same time. I'm a consultant and use Teams both for my client and for my own organization. Like others on this thread, I have to log in and out several times a day in order to traverse organizations. It would be ideal if the two accounts could be in a single UI (like having multiple email accounts within Exchange), but I'd be ok if I literally had to instantiate two instances of Teams. Just do something so I don't have to log in and out and in and out. Becomes even more painful when all these orgs use multifactor auth! I would have thought the federation option (like skype4business) would be a pathway forward (although can't get this working on teams yet). Actually the OneDrive app support multiple accounts and does it with ease. Same way teams should be able to do the same. The Outlook mobile app also work great with multiple accounts. We definitely need this. For my situation I was able to get around this by using the web browser in Incognito for one company and use the desktop client for the other. Great scenario! This is actually a requirement for us to be able leave Slack for using Teams instead. Let the company have a settings on the company domain level that user is allowed to sign in with only one organization. And if user is setting up teams on different machine other than Org domain, then let them connect to as many orgs as they need. Many MVPs who need to access Office 365 for multiple customers now use Chrome's ability to have multiple identities, use the Manage People link under the person icon at the top right. Then you can easily switch between multiple tenants for the full suite of browser apps including Teams. It's not ideal, really you would want one activity feed and source of notifications, but it's probably the best option for now. I vote this approach as well, since I use it a lot. You can also join channel meetings (no video) if needed. This is also a good practice, since you get access to other available tenant resources from the same identity. Switching tenants and identities is a lot easier in mobile app, which is good since on mobile you can access only single tenant at one time. Totally agree with this. I am a consultant who always has this issue. Great to see a new update on UserVoice! This is a huge issue for me switching between tenants. I try to work around it by signing off and back on, but that takes a good 30 minutes of changing Settings to not auto-sign in, signing out, having Teams auto-sign me in (yes, even though I just turned that off). Going into Settings, changing them yet again, and repeat until finally Teams prompts for a different account. Seriously, I lose 1-2 hours every single day on this. I can't even use the web-version of teams because the only thing that can be shared in a meeting are PPT files, so screen sharing meetings are not even an option! Unfortunately this still doesn't solve the Teams App issue. Using multiple chrome instances for Teams is one thing, but the web interface is missing many things that the desktop app has. Yes, Chrome is missing some things desktop has but for me it is still way better way than to switch to different tenants in a app. It a browser is not a perfect solution - but a solution that meets even 70% of things - I rather use it than choose not to use Teams. Some people use Franz to access multiple tenants as well. That app too has it's limitations, very much like with a browser, but apart from meetings you ought to get chat & conversations working. This is a make-or-break feature. For me this is MUST have. Fo now I use multiple web Teams in seperated Chrome profiles, this solution is working for all O365 applications available by WWW. Good then they are cooking something up! I would say this is a must have for us who joins several domains/account and other projects. Slack will always win as long as I can’t follow several accounts in parallel. Hook us up already, teams dev team!!! Still needed for working with partnerships across separate organizations! External Guest access setup as a workaround to missing multiple tennent logon functionality. This does not resolve the issue. We need to be able to connect to a tenant via that tenant's domain, not as a different one. Guest access does not provide the same experience as full-tenant access (using VSO, SharePoint perms, etc). Sync multiple SharePoint document libraries? Edit messages from other users?